It turns out that the correct quote is as follows: “Sell all that you have (not least of all some of your stock of current sermonic literature) and buy Spurgeon (even if you have to grub through the second-hand bookstores). The statement was made by German pastor Helmut Thielicke in the book Encounter With Spurgeon. It was in the midst of grubbing around through some second-hand books years ago that I picked up a cheap and decent copy of Thielicke’s book. Most of his book consists of selected Spurgeon pieces from Lectures to My Students. For that reason, I shelved the book–which cost about 50 cents–and neglected until yesterday. Thielicke’s 45 page introduction or case for reading Spurgeon is an excellent exhortation and coverage of the man and his influence. But, anyone who writes about Spurgeon faces the inevitable challenge: How can you say enough about the man? This is not hagiography or creating a mythical near-perfect man. He had his faults and limitations, but he was incredibly balanced in his ministry and life. And productive. His writings total more than the Encyclopedia Brittanica. His church was a mega-church and a number of ministries sprung from it. Spurgeon’s sermons and writings were best sellers in his day, and his books still sell today. The main challenge of a preacher is listening. The preacher’s mind is gathering bullet points for the sermon, picking up exegetical details on the text, absorbing and improving upon the commentaries, fashioning the order of the sermon, finding the perfect beginning and ending, and thinking through who will be sitting in the congregation and how the sermon will or should impact them. Think, think, think, read, read, read. That’s all part of the life of ministry. But the preacher–far more than the lowliest congregant–needs to be preached to. He needs to hear. This again recalls the importance of having Spurgeon’s works, reading Spurgeon, and selling other goods in order to buy Spurgeon. There are 3 (and who knows how many more) examples I might appeal to. These 3 men have all been pastor/examples/mentors to me along the way. First, Henry Wood who introduced me to Calvinism and Spurgeon, Warfield, Gordon Clark, Loraine Boettner, Gregg Singer, R. J. Rushdoony, and so much more. Prominent on his bookshelves was his set of Spurgeon’s Metropolitan Tabernacle Pulpit. Then there is the respected and revered Pastor Mickey Schneider, who now lives in Florida. I first heard Pastor Schneider in the summer of 1980 while I was taking a couple of courses at Reformed Theological Seminary in Jackson, Mississippi. Mickey was pastoring a Presbyterian church in Jackson and was preaching through his favorite book, Ecclesiastes. His sermon was on Christian education, and I was already committed to that, but was further confirmed in that conviction. It would be many years before mine and Mickey’s paths began crossing again. He has been here in Texarkana on several occasions to preach (and visit his daughter). He is Mr. Southern Presbyterianism, in my view. He has met every one, known them, shared vital experiences with them, and either stood alongside them or opposed them along the way. Who else watched Martin Luther King, Jr.’s “I Have a Dream” speech with Cornelius Van Til (who was in a bathing suit about to go swimming)? Who else wandered around lost in Jackson, MS with R. J. Rushdoony as his passenger? Mickey (sometimes Michael and, at least once, Arthur) Schneider alongside his wise ministerial counselor and wife, Judy. 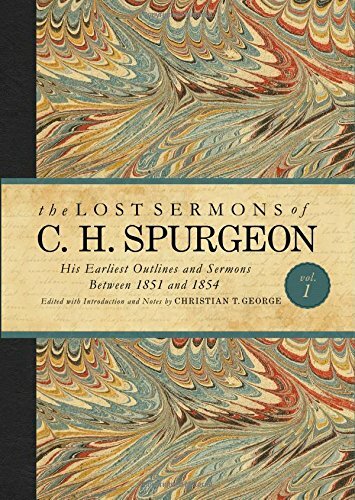 This is all background to my having started on reading The Lost Sermons of C. H. Spurgeon, edited by Christian T. George and published by B&H Academic. This first volume costs a bit, but it is worth the money. First of all, it is a beautiful volume–both inside and outside. (Please don’t let me know if you acquire a kindle version of this. That would be like having a kindle version of a great work of art.) There is something, no a lot, to be said for owning really nice hardback, beautiful editions of books. This Lost Sermons series–and we only have volume 1 available at the moment–will increase the amount of Spurgeon materials by 10%. Astounding, especially considering how relatively short Spurgeon’s life was. My recent Spurgeon quest has already had yet another benefit. I have gotten re-acquianted with Pilgrim Publications in Pasadena, Texas. Started by Bob Ross, who is still active in this book ministry, Pilgrim has been re-printing and publishing Spurgeon’s works for decades. In fact, the Metropolitan Tablenacle Pulpit–as pictured above and below–is one of the major productions of this organization. They also publish The Treasury of David in seven volumes, rather than the 3 volumes that Baker publishes. What is the difference? Mary Barber of Pilgrim explained it. She writes, “The one from Pilgrim is unabridged, unedited, word for word in both typeset and design, reflecting the original Passmore and Alabaster editions first published by Spurgeon.” Oh my, even the Spurgeon books I do have aren’t enough! 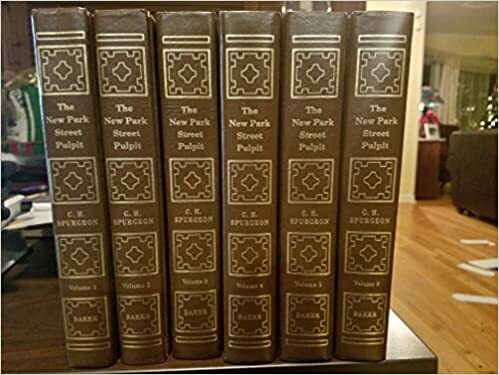 Pilgrim also publishes the rich New Park Street Pulpit, which consists of sermons from an early (but not the earliest) stage of Spurgeon’s preaching. These sermons are often the most quoted in conjunction with Spurgeon’s Calvinistic convictions. The conclusion of the matter is simple: I must have the Metropolitan Tabernacle Pulpit. The one volume I own is not enough. 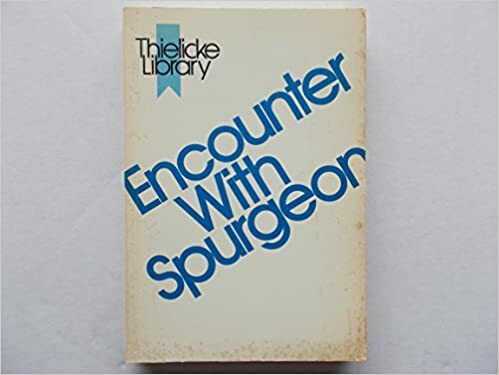 Until then, I am going to continue reading and enjoying Thielicke’s Encounter With Spurgeon and The Lost Sermons of C. H. Spurgeon. Also, I have some items for sale. Any one interested? I first became aware of Gordon Clark somewhere around 1975-76. He was approaching his last decade, but was still actively writing, while I was just newly introduced to the vast realm of Reformed theology and thought. There were, for many of us newly minted Calvinists of that time, two primary pillars that were both the attraction and battering rams in Reformed life. One was soteriology, and remember that we like big words like that. Soteriology is the doctrine of salvation, and for Calvinists, this began with grasping the Five Points of Calvinism. The quick track to the 5 Points was found found in a book consisting mostly of Bible texts, titled The Five Points of Calvinism: Defined, Documented, and Defended by David Steele and Curtis C. Thomas. 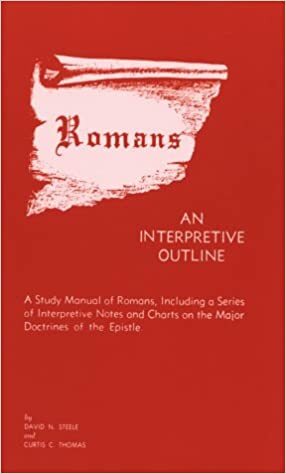 But that short book was originally an appendix to Steele and Thomas’ key work titled Romans: An Interpretive Outline. Both books were published by Presbyterian and Reformed Publishing Company. 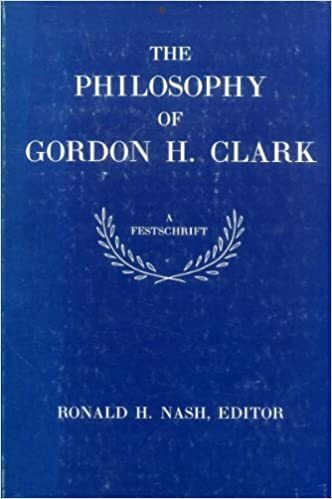 The man who wrote the introduction for the Romans book and who urged Charles Craig of Presbyterian and Reformed to publish it was Gordon Clark. At that same point in time, Presbyterian and Reformed mailed out a newsletter every month. At the bottom of the newsletter was a list of books that were on sale, often for a dollar. 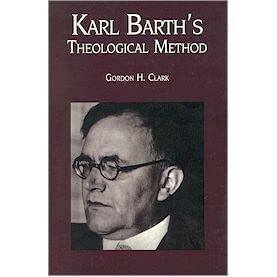 One of the book I got was Karl Barth’s Theological Method by Gordon Clark–a hardback edition for a buck! I also got Clark’s book Biblical Predestination. The book on Barth was out of my league, but I was reading everything I could find on predestination. Over the years, I continued to buy books by Gordon Clark here and there. I never sytematically or rigously read his books, but through the years I read one here and there. Favorites included Historiography: Secular and Religious (reviewed here), The Christian Philosophy of Education, A Christian View of Men and Things, and his commentary on 1 Corinthians. 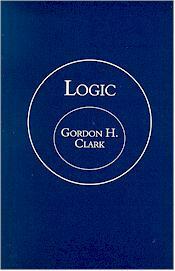 Right now, we are studying Gordon Clark’s book Logic in both classes. For Logic class, the book is an introduction, albeit a “push you off into the deep end of the pool” approach…. Clark was a brilliant man, a key Christian philospher, and according to many student testimonies, a great teacher. He was not necessarily a great writer or communicator of logic skills. His book rambles; he makes statements without support; he raises questions he does not answer; he slips wit in where more details are needed; and he strays off here and there. The book gives me the sense of sitting in the presence of a brilliant man whose years of study, reading, and writing are being displayed for all to delight in. I love the book, and I rejoice that I do not have to use it as my primary logic text. It is a great supplement, a useful introduction, a helpful refresher. My copy is hardback with a dust jacket. The book has been reprinted as Gordon Clark and His Critics. The big awakening came somewhere around 2005 or 2006. A friend, Jeff Bruce, sent me a link to an article titled “The Closing of the Calvinistic Mind” by James Jordan. The article completely blew me away. But it wasn’t because it told me something new, but rather it reminded me of something from my past, as well as that of Jordan and many others. It was like discovering some vital links in your family tree. Yes, here were the Calvinist writers who had impacted and dominated my early years. Clark was back on the radar, but I realize now that I did not then nor have given him the wide berth he deserves as a pioneering Calvinist philosopher, worldview thinker, theologian, and model of scholarship. Douglas Douma’s newly published biography–Gordon Clark: The Presbyterian Philosopher–will be step one in remedying a widespect neglect of Gordon Clark’s life, thought, and books. Notice the second part of the title: The Presbyterian Philosopher. The good news is that Christians–Reformed, Catholic, and otherwise–have carved out a wide swath in the field of philosophy in our day. As is always the case with academic fields, philosophers–even those sharing Reformed credentials–fall into different schools of thought. Many are Dooyeweerdians, meaning that they subscribe to or borrow from or build upon the work of Dutch philosopher Herman Dooyeweerd. Many ascribe the expansion of Christian philosophical thought to Arthur Holmes who built the philosophy program at Wheaton College. The contributions of Charles Taylor, Catholic philosopher and author of The Secular Age, cannot be ignored. Time does not permit us to give the praises due to Nicholas Wolterstorf and Alvin Plantiga. But Gordon Clark is often ignored, overlooked, or dismissed (and disliked?). Long before Holmes developed the philosophy department at Wheaton, Clark was there influencing young scholars who made their own contributions in the field of Christian thinking. While Dooyeweerd’s work was still untranslated, Clark was writing on philosophy. While even card-carrying Calvinists sometimes flinch from the difficult doctrines of Scripture, Clark was using the Bible as a hammer–along with a strong does of Aristotelian logic–to pound philosophies secular and religious that he thought fell short of Biblical truths. Worldview thinking has become popular in Christian circles. There are many books on developing a Christian worldview, and I have and love quite a few of them. But Gordon Clark did not write about “developing a Christian worldview.” He demonstrated one. Consider the fact that he wrote about philosophy, theology, politics, education, pyschology, science, historiography, and other subjects. Clark is often remembered today for the many theological controversies he was embroiled in. Beginning with the defining battles in the day with J. Gresham Machen and the liberals of the Presbyterian Church in the north, the twentieth century was the era of “Machen’s Warrior Children,” to use John Frame’s phrase. A great battle within the Orthodox Presbyterian Church was the debate over “The Incomprehensibility of God.” It pitted two giants against each other–Gordon Clark and Cornelius Van Til. Douma’s biography aptly covers this conflict, which is often referred to as the “Clark-Van Til Controversy,” but could be called “The Incomprehensibility of Gordon Clark and Cornelius Van Til” controversy. We can take sides, eschew both sides, wring our hands, vilify either combatant–or more properly, those who continued the combat, or just shrug our shoulders over the whole mess. But it happened and it impacted–and likely reduced–the influence of Calvinistic thought and Presbyterian church life in America. The failure of Presbyterians to build more inroads and expansion within Fundamentalist churches have left us with small, very orthodox Reformed congregations. Leave it to a Calvinist like John Piper to market the message to a wide audience. 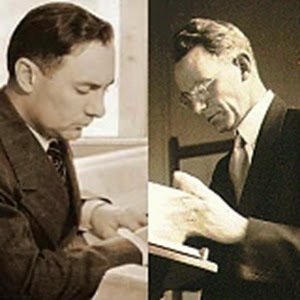 The two primary combatants–Gordon Clark (left) and Cornelius Van Til (right). 3. Gordon Clark’s name and fame may not be in big lights right now. 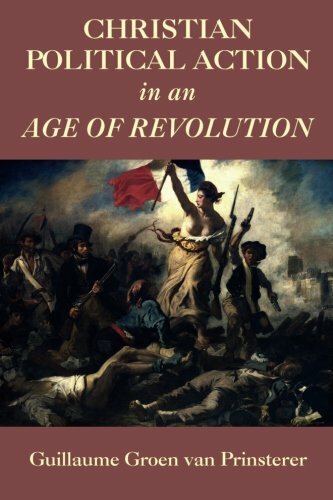 And I suspect that Gordon Clark: The Presbyterian Philosopher will not be a “New York Times Best Seller.” But this is an excellent book and will be a catalyst for many to read Clark again (like me) and others to discover him (as Douma himself did while reading John Robbins’ book on Ayn Rand). When asked which theologian from our times will be read in 500 years, R. C. Sproul answered, “Gordon Clark.” Well, I reckon that Dr. Clark, Dr. Sproul, Douglas Douma, and I can judge that comment more accurately in that other realm and not having that long to wait, read Clark now. But begin with this biography. Although they sparred over theological and philosophical points, both Clark and Van Til respected and esteemed one another. As Van Til often affirmed to friends, “Soon we shall sit at Jesus’ feet.” Before that day arrived, they were reconciled. By the way, I must admit to not liking the author Douglas Douma. I am not well acquainted with him, but I have this against him: 1. He is too young to have written such an outstanding book. 2. 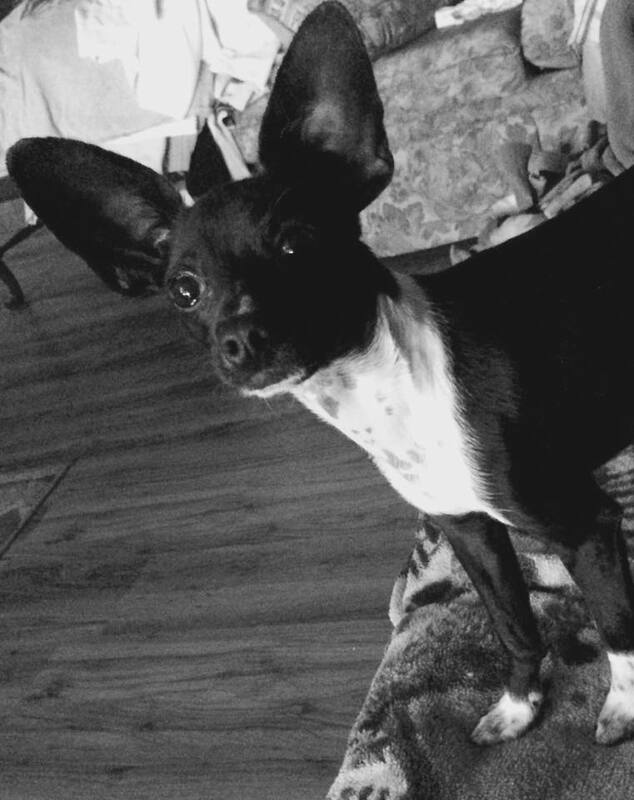 He is too smart, since he has degrees in mechanical engineering, business, and theology. 3. And he is athletic and outdoorish. All three traits have me miffed. Should a serious author really be standing at Horn Peak (13,450 feet) like this? How should we say it? Russell Kirk was ahead of his times? Or Russell Kirk was behind his times? Or Russell Kirk was out of step with his times? Or Russell Kirk was beyond his times? Or Russell Kirk is a man of all times? 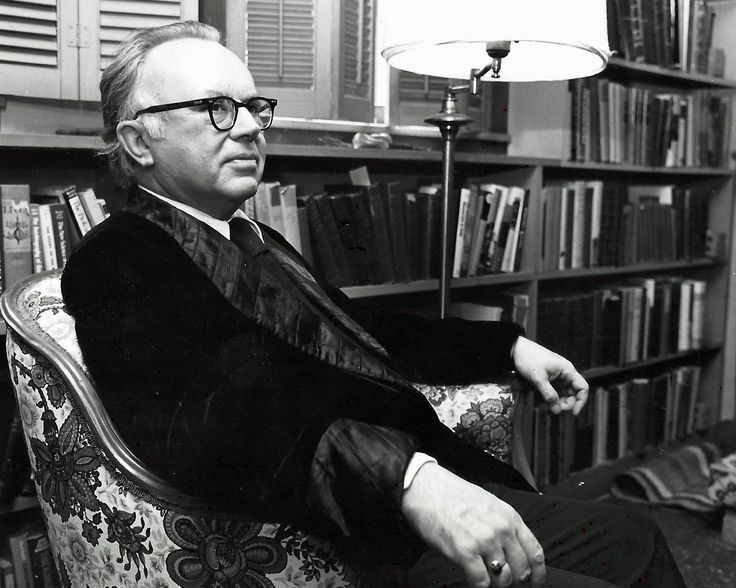 Maybe Russell Kirk is largely forgotten. I never know because people that live in my mind and thoughts are usually don’t exist for most people. That is not said to sound smug. But, seriously, who all are seriously concerned about the ideas of Russell Kirk, William F. Buckley, J. Gresham Machen, Christopher Dawson, Gordon Clark, Cleanth Brooks, and Richard Weaver? Most of those men’s lives correspond with mine, although in most cases they died before I had ever heard of them. Pick an earlier century and the names become even less well known and more obscure. Let’s begin by placing the blame on abundance. There is simply too much to learn and too many people from the past to know. In my Ancient World Humanities class, I always feel that we can get a good amount of at least representative examples. Students can read Hesiod, Homer, parts of Herodotus, The Republic by Plato, Rhetoric by Aristotle, a few Greek tragedies, along with a few Romans like Virgil, Ovid, and Cicero. Then if they work on Caesar’s Gallic Wars, a high school student has a good jump on the extant writings of the ancient world. 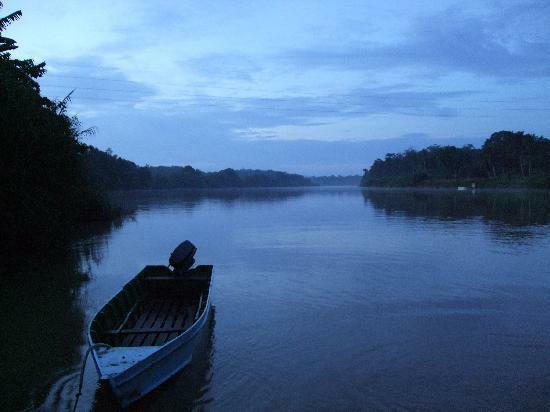 But the river reaches flood stage during the subsequent early church era. There are excellent choices for the Middle Ages, and one can gain some traction with a reading of as few as ten books. Of course, any list of ten books is excluding 10 more that equal or excell them. “Flood stage” doesn’t begin to provide an apt metaphor for the modern period of history (meaning from the Protestant Reformation to the present). The works growing out of the American experience once again become overwhelming, as witnessed by the Library of America publications. So, how are we expected to remember even the most basic things about most people and books? My official answer–based on over 45 years of working on these matters–is this: I don’t know. 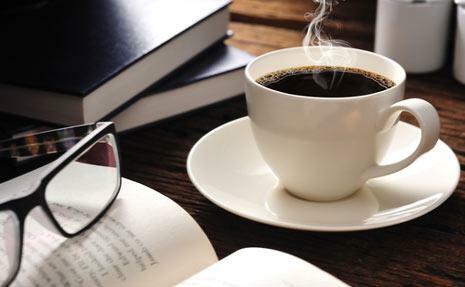 In the meantime, those who love learning, books, ideas, the past, people, and how all those things mix and mesh will keep reading and learning. All of this mental wandering about books might just sound like the ever day musings of those people (of whom I have heard) whose lives are measured out with bookshelves (sorry, Tom). But books, ideas, and thinkers of the past are not just the province of bookish teachers, writers, and bibliophiles (which has a slightly evil sound to it). For a decade or two now, we have been hearing and hearing about conservative talk radio. It is good that the older media monopoly has been broken and that a host of other outlets are available. To paraphase Andy Warhol, in the future everyone will be a political commentator for 15 minutes. But some are political commentators for 2 to 3 hours–daily. And they proclaim themselves conservatives, and they wage relentless attacks on liberals, big guv’mint, the welfare state, and various opponents in the culture war. 2016 revealed lots of things about Americans, both good and bad. (Don’t worry if it takes a while to think up the good things.) One thing that is certain is that conservative talk radio and many who call themselves conservatives really are not conservatives at all. They are more nationalists, protectionists, isolationists, and opponents of everything they lump together as the Washington establishment. That is not to say that I disagree with the main body of folk and spokespeople who rally under the name of conservatism and who invoke Ronald Reagan’s name often. Nor am I living in denial or absolute angst over the election and now early adminstration of President Trump. But Conservatism is in trouble and largely because we don’t know what Conservatism is nor what we should be trying to conserve. Hence the urgency of Russell Kirk. Hence the importance of Bradley Birzer’s biography of Russell Kirk. Hence the necessity of plodding through some of the many books written by Kirk and his intellectual colleagues and fellow travelers. I started reading Russell Kirk: American Conservative, published by the University of Kentucky Press, on November 3, 2016–the night that the Chicago Cubs won the world series. (I only paid attention to the final score of that game.) I finished the book early in March 2017. During December, there was a long gap where I was not reading the book, due to the final illness and death of my father and then the flurry of Christmas celebrations. At some point–in either January or February–I was flustered at my incredibly slow pace of working through the 500 plus pages of text in the book. This was a review book that I am duty bound to read and comment on. The author, Bradley Birzer, is one I had already formed a high opinion of because of his biographies of J. R. R. Tolkien and Christopher Dawson. I began with extremely high interest, but found myself slowly working through the book. Part of the slow pace was due to my reading the book late at night, propped up in bed, after a strenous day of teaching school, and near the time when sleepiness overwhelms love of reading. Then–maybe after reaching page 400–I realized something. This is not a book to hurry through. This is not a page-turner, a who-done-it, an escape reading, and I like all those types of books. 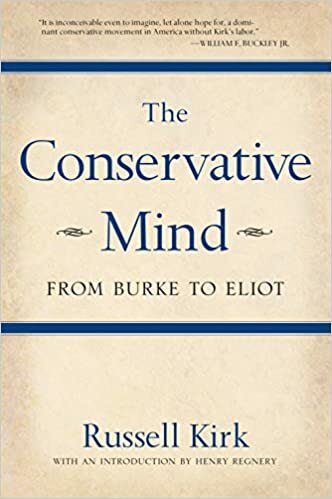 Instead, this book is a primer on Conservatism through the lens of a key Conservative thinker. This is a book filled with homework assignments, with lessons to be completed. This book is Conservatism 101; no, more a graduate level 501 course. The reader is expected to master the lectures–the book–and then begin his/her journey through the assigned/suggested/formative works mentioned throughout this book. One could write a very short biography of Russell Kirk. This short: “Russell Kirk was born in 1918. He read lots of books and thought deeply and then wrote lots of books. He died in 1994. He was a major figure in the Conservative movement.” Mr. Kirk was–by most standards, but not mine–a very dull, ordinary-looking, overly bookish fellow. How does a life parked at the typewriter merit 500 pages? Well, first of all, Kirk was a scholar, writer, thinker, but he was far from being simply desk-bound. He traveled, entertained a host of friends, sparred intellectually with friends and foes, participated in political battles, enjoyed ghost stories, and fathered four daughters after a marriage late in life. But the book is mainly the odyssey through Conservative thought of the past as remolded and fitted to the American experience. Hence the reading assignments that are necessities after this book. Edmund Burke is high on the list. 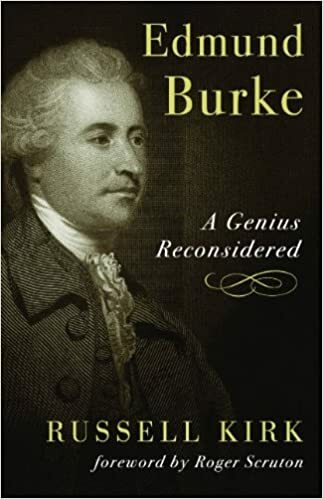 Kirk wrote a biography of Burke, but one absolutely must go to the source. Kirk was also deeply devoted to the writings of Christopher Dawson (whose praises I have often sung), T. S. Eliot (both his poems and essays), Albert J. Nock (older libertarian), Irving Babbit, the Southern Agrarians, and key Greek and Roman thinkers. As Kirk slowly moved from being Christian-and Catholic-oriented to actually joining the Catholic Church, Christian doctrines and theology also impacted his thinking. His intellectual life is itself a course in intellectual history–from a conservative angle. Add to that his friends and colleagues. Kirk was a peer with and a complement to William F. Buckley, Jr. They were contrasts in many ways, but they worked together for years with Kirk being a major contributor to National Review, founded by Buckley and still the flagship of serious conservative thought. Kirk’s range of friends also included Flannery O’Connor (Southern author of incredible fiction), Ray Bradbury (with whom Kirk shared a love of writing fiction, particularly ghost stories), T. S. Eliot (of whose thought Kirk wrote a book), Wilhelm Ropke (Christian and economist), Donald Davidson (one of the Agrarians), and Sen. Barry Goldwater, whose campaign for the Presidency represented a high point for Conservatism. He had intellectual enemies and sparring partners as well. Some of these bouts were “iron sharpening iron,” but some were quite hostile. Libertarians, ranging all the way back to John Stuart Mill, often received Kirk’s scorn. That is not to say that Kirk did not sometimes find comaraderie with Libertarians. Writing as someone well acquainted with intramural doctrinal battles within Presbyterian and Reformed Christian circles, I was not surprised to see Conservatives squaring off and battling one another with incredibly ferocity. After my November start of this book, I found myself beginning my list of “must reads.” Happily, I already own many of Kirk’s books, but I have either only read small portions or read the books long ago. And I have begun to search out and gather the books and works of authors who Kirk approves of. Conservatism as a word offers no hope. There is much in the present and more in the past that needs to be swept into the dustbin of history. One has to know what one is conserving and why. We have to know the best of the traditions, the enduring aspects of the culture, the truths that are most in danger in order to begin the work of conservation of a good, godly Christian, and Conservative world order. This book–read slowly and deliberately–is a good beginning. A serious weighty collection of Conservative thought which includes Kirk and many of his colleagues. This book propelled Kirk into the center of the Conservative movement in its early stages and remains a key work on the mind and movement. 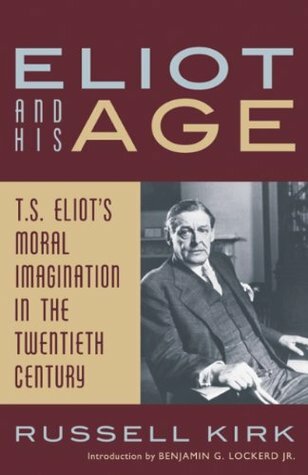 Kirk’s study of T. S. Eliot–poet, essaying, Christian Humanist. A feast set with Kirk’s books. It was the late 1970s and I was sitting in one of Professor Henry Wood’s history lectures furiously taking notes. I could have focused on the key history details and only wrote down those matters pertinent to the next test. But I never could focus just on that. Without knowing the exact words, I was following the concept of “the student must become like the teacher.” By that, I believed that if a teacher said, recommended it, mentioned, or modeled it, I should follow that lead. At any rate, I wrote it down. Books were just beginning to accumulate in my life. While most of my buys were histories and literary classics, more and more were books on theological and Biblical topics. I wasn’t changing from a history to a theology major, but my mind was undergoing a transformation. The change was as radical in many ways as my own personal salvation of a few years prior had been. But who was this Spurgeon and why were his writings so valuable? We are talking about Charles H. Spurgeon, the great English preacher of the late 19th and early 20th centuries. Sometimes called “the Prince of Preachers,” he spoke without technical amplification to thousands each Sunday. Hearers had to obtain tickets to hear him preach. His sermons, lectures, and books were mass produced in his day. Even in our time, there are an innumerable amount of the writings of Spurgeon ranging from the inexpensive to very expensive works. First confession, I failed to follow Mr. Wood’s advice at that time. 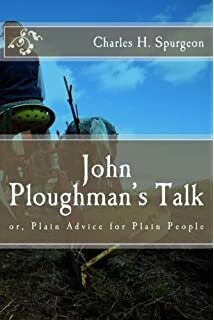 I did buy one small paperback, which was titled John Ploughman’s Talks. The sayings and stories in that and other John Ploughman volumes are quite enjoyable, but that small volume didn’t quite convince me of the worth of Spurgeon. Through the years, I mainly picked up quotes here and there from Spurgeon about faith, prayer, the Bible, and the Christian life. Moreover, many Calvinist writers quoted really great Spurgeon statements on Calvinism, predestination, election, and salvation. Spurgeon is so useful for quotes and quips that I even purchased a book of Spurgeon quotes. Along with that, there are really popular books such as Morning and Evening, which is a devotional book that has been reprinted and revised many times. Perhaps the most influential book I read about Spurgeon was The Forgotten Spurgeon by Iain Murray. That book is one of the most important books on church history and theology and ministry ever written. It was the first of many reads of books by Iain Murray, who combines good story telling in biographies with solid theology and instruction. You never know in reading Murray if you are gaining more in education or edification. This may have also been my first time to read a Banner of Truth book, of which many reads and acquisitions have followed. The book traced several battles that Spurgeon found himself in the front lines of during his life and ministry. One was over the Doctrines of Grace, a.k.a., Calvinism. In his early years–and no one has ever surpassed Spurgeon’s sermons when he was too young to be preaching!–he preached at a church called New Park Street. His most doctrinally powerful sermons on grace from what we call a Reformed perspective was preached at New Park Street. The multi-volume New Park Street Pulpit is one of the best resources around for reading Spurgeon’s work. Calvinism has often come under attack. Its popularity has often waxed and waned, and Spurgeon was defending what seemed to be a losing cause by defending Calvinism in his time. He was definitely going against the grain, against the waves, against the trends, against the times, against the prevailing winds, or whatever other metaphor is apt. He was convinced, however, both of the truth of what he was preaching and teaching and of the ultimate revival of the doctrines he loved. Spurgeon also battled for the truth and authority of the Bible during the Down-Grade Controversy. No, the 1800s were not the “good old days.” The Baptist Union of which Spurgeon was a part voted him down by a large majority because of his views of the Bible. Even though he had many followers, church members, and students, he was increasingly a forgotten man by the time of his early death in 1892. Thanks to Iain Murray’s work in writing The Forgotten Spurgeon, the only thing that is really questionable about the book is now its title. Spurgeon is very much remembered, appreciated, loved, and read today. 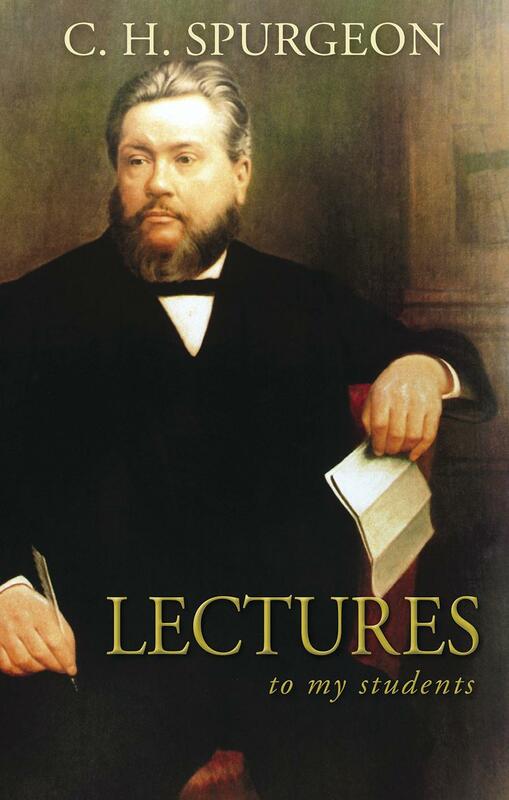 The most important and influential Spurgeon book for me in recent years is his set of talks titled Lectures to My Students. 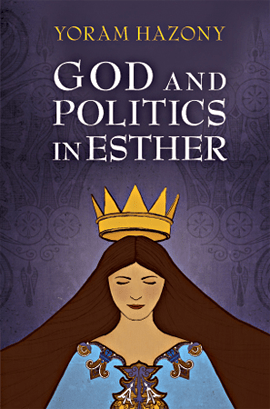 This work has been reprinted by several publishers over the years, but the Banner of Truth edition is the most complete and is the nicest in terms of printing and format. I had read from portions of the book through the years, but then finally read it from cover to cover. It is an incredibly good book for preachers, teachers, students of the Bible, and teachers and students of speech and rhetoric. Many of the talks in this book were given by Spurgeon on Friday afternoons to the seminary students. Par for the course and characteristic of the man, the book is full of wit (which transcends the passage of time), insight, convicting exhortations, and practical advice. It is also a wonderful glimpse into the personality of Sprugeon himself. I think one of my favorite experiences in reading this book was a chapter where he defended his own style of topical preaching as opposed to expository preaching through a longer text, a chapter, or book of the Bible. I disagreed with Spurgeon both before and after reading the chapter, but I thought it was a marvelously well done piece of writing. I heartily recommend the book to all, except preachers. In their cases, I require the book. This means that this is the first of many gems that will further enrich us with Spurgeon’s print ministry. I can hardly wait to start digging into this book. His auto-biography, published in two volumes, is yet another fine Banner of Truth production. They are titled The Early Years and The Full Harvest. There have been quite a few good biographies of Spurgeon. A really good shorter work is the one done by Arnold Dallimore, titled Spurgeon: A Biography. You may remember Dallimore for his excellent two volume biography of George Whitefield. 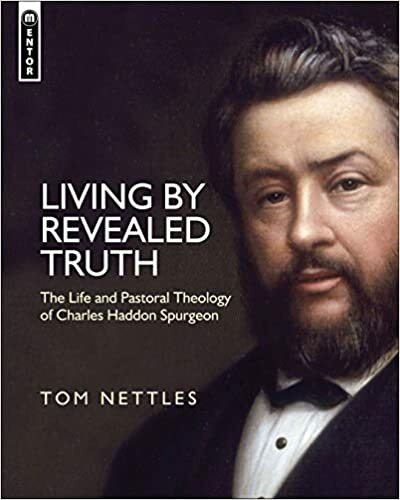 Then there is the rather extensive and more recent biography of Spurgeon done by Tom Nettles, titled Living by Revealed Truth: The Life and Pastoral Theology of Charles Haddon Spurgeon. 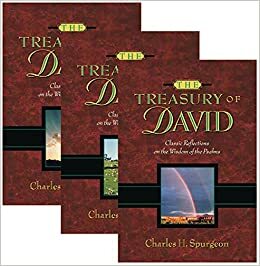 No discussion of Spurgeon would be complete without mentioning his classic Treasury of David set. These three volumes are “treasured” by all who love good Bible commentary that is solid, exegetical, and very practical. Often reprinted, this set is a must. 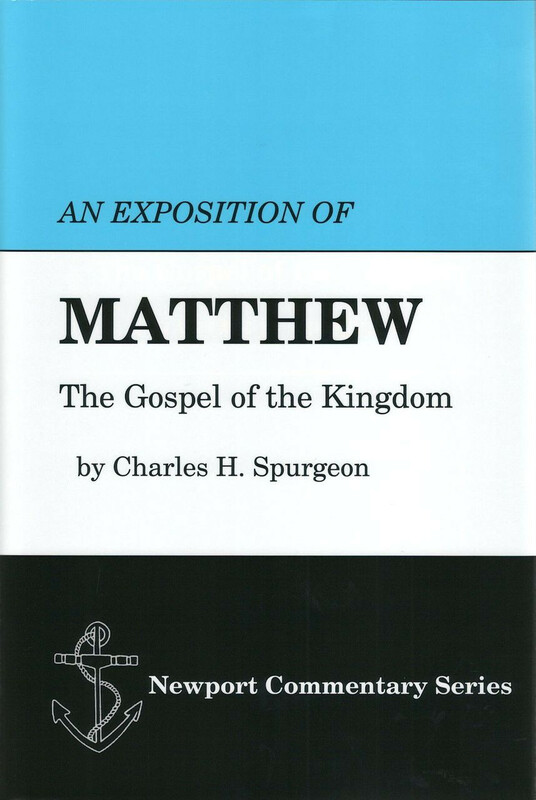 The only other case where Spurgeon wrote a Scripture commentary is the Gospel of Matthew. His commentary has been reprinted by Banner of Truth. There is also an edition of this commentary that includes some of Spurgeon’s letters which was published by The Particular Baptist Press. While there are numerous collections of Spurgeon sermons, the most complete is the many volumes of the Metropolitan Tabernacle Pulpit. There are over 60 weighty volumes in this set. I own one measly volume. Some years ago, I bought a large number of these from Pastor (and friend) David Richardson, who decided to read Spurgeon via his computer rather than having the set of books. I then sold them to another friend and book dealer David Leach, who wanted them for himself. I have felt–since then–like a wayfaring stranger, wandering through this world without these books. Pilgrim Publications sells the Spurgeon set, as well as many other fine editions of Spurgeon’s works. The Metropolitan Tabernacle Pulpit set they offer has 48 hardbound volumes and goes for a mere $1074 (less than $23 a volume). Many a good pastor has read Spurgeon sermons for years. We don’t read him so as to preach like him, but we read him so that we can be instructed. So, younger readers, as well as those my age and beyond, sell your shoes (or skip buying that new pair) and buy the works of Spurgeon. Let’s start with his lost sermons.